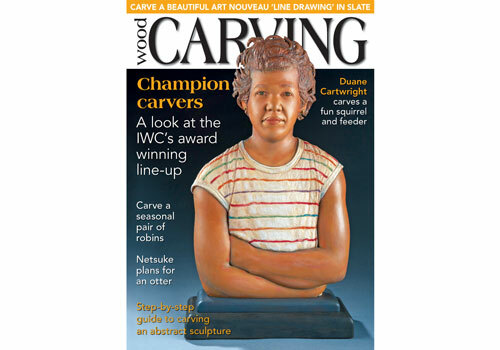 Issue 148 of >Woodcarving is filled with a host of great articles for you. Steve Bisco carves a beautiful Art Nouveau ‘line drawing’ in slate; Steve Heath carves an underwater scene; Mike Wood carves a pair of robins; and Duane Cartwright carves a squirrel and feeder. In ‘Features’, famous faces were on show at the International Woodcarvers Congress; we visit the workshop of Israeli woodcarver Benny Aharon; and look at the Aztec Calendar Stone in Mexico. We have some great ‘Techniques’ pieces for you, such as Dennis Zongker carving decorative scrolls on table legs; Andrew Thomas carves his sculpture, Divinity; Bob Jubb shares his ideas for carving otters; and David Western helps to untie some knotty issues. We also have our usual Carver’s Toolbag, and our ‘Community’ pages, featuring from the Editor, news and events, and a peek at our next issue. All this and more in the Woodcarving issue 148, so be sure to get yourself a copy, or why not subscribe and save up to 30%?